Dialogue, and those pesky pronoms relatifs! Dialogue is my favorite part of fiction. I love to write it, and I love to read it. I love it when (my) characters talk. It accomplishes the “show, don't tell” rule – which we writers must obey – nicely. It also moves the story along and is a good time for conflict to arise. It can be serious, funny, embarrassing, comforting, sincere, deceptive, despairing, upbeat, or – pretty much anything. 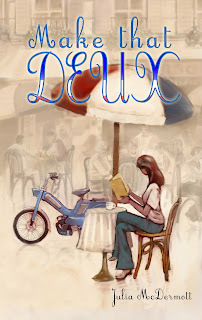 My novel MAKE THAT DEUX is written in the “first person” point of view, and the main character, Jenny Miles, even talks to herself (not out loud, normalement) – she often uses “internal dialogue” to reflect about life, the French, men, etc. During her year in France, she talks to her boyfriend back in the States on the telephone only a few times, since it’s very expensive. But he also “speaks” to her regularly through handwritten letters mailed across the Atlantic. 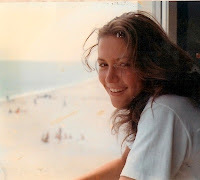 Meanwhile, Jenny talks to her roommates and other friends – usually in English – while doing her best at school and elsewhere to learn to speak fluent French. She's been studying the language for years, and she can understand it most of the time - la plupart du temps. Which is fortunate, since all of her college classes are taught en français, complete with “blue book” written exams and the occasional oral exam thrown in. Fast forward to the present, and my love of dialogue. Récemment, my French (conversation) class, taught by Madame Marie-Hélène, has been reviewing relative pronouns. You know: those necessary words that we don't think about, but that we use all the time (and that make our dialogue flow more easily): who, that, which, what, whose, whoever, whom, whomever, of which, whichever, where and when. Most of which are necessary in dialogue. Some other relative pronouns are used just with certain verbs, and are somewhat trickier (I’ll let you guess the translations): auquel, auquelle, auxquels, and auxquelles. Yet others are used only in certain cases: avec qui, en qui, chez qui, près de qui, à côté de qui; ce que, ce qui; sur/sans/dans/chez lequel (or laquelle); and, of course, simply à laquelle. You can imagine how many times Jenny, her boyfriend, her roommates and friends use (English) relative pronouns during dialogue scenes. If they didn't, it wouldn't be naturel. However, they often omit the word “that,” which is okay to do in English; it’s not okay to do en français. But when they talk to each other, we get to know them through their conversations, just like we get to know our friends…friends with whom we speak, using whichever words we prefer, where and when we meet, doing what we want to do, together. before breaking them... no matter what language! Three American college girls living in an apartment on theMediterranean. Two boyfriends back home. "The One" (and only), ifit's "meant to be" -- whatever that means! Jenny Miles has three goals: to speak French like a native, to travel all overEurope, and to have a blast. Meanwhile, two men compete for her attention andamour, ici et là. C'est compliqué! Take 10 months. Add 2 (surprise)transatlantic flights, 2 Greek isles, 1 moped (une mobylette) and beaucoup delettres! Subtract 1 phone, 1 promise to be faithful, and 1 bikini top. Lasolution? Make that...a year that Jenny will never forget.